Caramel Wings: Recipe: Karwari Style Pan Fried Fish. 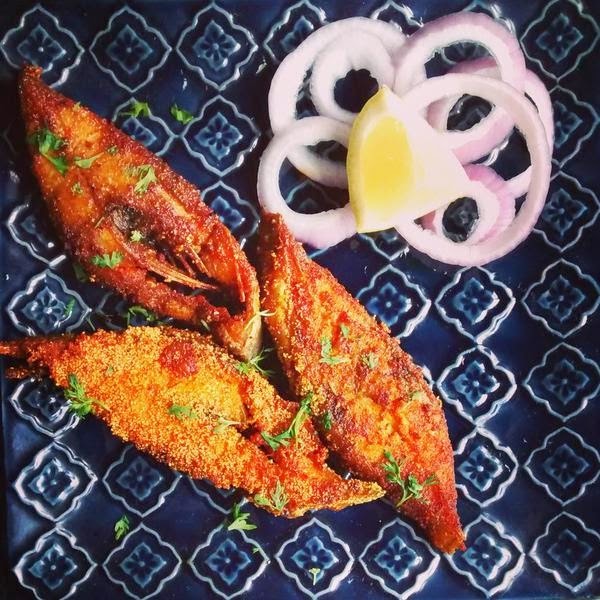 Recipe: Karwari Style Pan Fried Fish. For those of you who don't know, I come from Karwar, a beautiful, touristy spot just ahead of the border between Goa and Karnataka (towards Karnataka). I was born and raised in Mumbai, but the annual visits back to Karwar to our ancestral home for Ganpati made sure I could indulge in the beauty of this little town. As a kid, I hated it - I was away from my home, my bed, my people and my life. I had to live in an old ancestral house full of people from everywhere and it was all quite a chore. As time went by, I grew to appreciate the serenity, and now its more of a much needed break from the fast paced city life, where you can just lay back and relax. I have memories of my aunt cooking fresh Mackerel on the coals, and all of us cousins sitting in one straight line with our legs crossed, and as soon as she'd bring those beautiful fresh charred fish stuffed with homemade masala, topped with a squeeze of fresh Lemon, we would attack with our bare hands and go to omnomnomnom-land instantly. Time has gone by, there is no choolha at the ancestral house anymore, but we still bring some coals and char them Mackerels every time we visit. Back here in Mumbai, Mom prepares her Signature Fish Curry (Dad won't eat any other) and saves some pieces for Fish Fry. My Dad likes them coated with Semolina Flour, crisp on the outside and loaded with flavour on the inside. I, on the other hand, like it just slathered with Masala, and pan fried with a touch of Oil. It tastes great while being super healthy, and I made a sLITE change by reducing the amount of oil, not coating it with any flour, and using low sodium Tata Salt LITE. I have used Halwa pieces here (Placed both kinds of fried fish, with and without semolina in the picture), but you can use the same Masala for any Fish, Prawns, Squids or even Chicken. 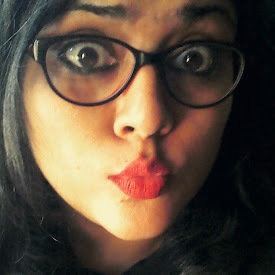 Sometimes I eat an entire pan fried Pomfret for Dinner. Its high protein and guilt free, and super easy to prepare! Mix all the dry ingredients in a flat plate. Add the lemon juice, 5-6 drops. Then add water, few drops at a time and mix with your fingers so as to obtain a paste-like consistency. Apply this paste to your seafood and massage thoroughly. Let it sit for 30 minutes in the refrigerator. Please wash your hands after this step, you're working with Chili Powder after all. Heat up the Oil in a pan on High. Add in the Fish pieces and let them sear, about a minute each side. Once the pieces look like they're browning, turn the heat to low and let them go for 1.5 to 2 minutes on each side. Serve them with a squeeze of Lemon and lots of thinly sliced onions to go with!